Manny the mammoth (Ray Romano), Sid the sloth (John Leguizamo), and Diego the sabre-tooth tiger (Denis Leary), are enlisted by weasel Buck (Simon Pegg) to face down an apocalyptic asteroid. Buck is introduced anew with possibly the most unlikely musical number imaginable, new lyrics to the tune of ‘Figaro’s Aria’ from Rossini’s Barber of Seville; which turn it almost into a Gilbert & Sullivan jape. Nick Offerman drolly voices the dino-bird patriarch disapproving of his weakling son Max Greenfield, and Jesse Tyler Ferguson enjoys himself as the snooty Shangri Llama. There’s an amusing cameo from Neil deGrasse Tyson as a voice in Buck’s mind, but overall there’s not quite as many laughs as you’d like. 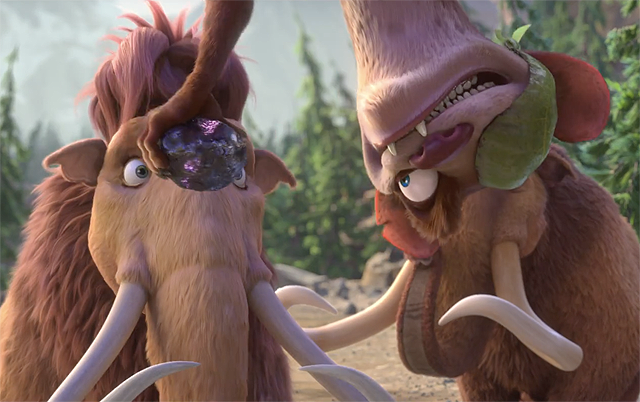 Having said which the central arc of parental disapproval is infinitely preferable to Ice Age: Continental Drift’s incredibly unsubtle and irritating arc involving Peaches and the too cool for school mammoths she desperately wants to befriend. Whereas the dialogue and voicing of those scenes was excruciating, nothing in Ice Age: Collision Course is ever obnoxious. It is curious to have arrived at Ice Age 5 14 years after the original. 5 year olds who enjoyed the first movie are now 19 year olds, think about that. Michael J Wilson, who wrote the 2002 story, returns for the first time to script with Michael Berg and Yoni Brenner. Brenner previously wrote on the dinosaur instalment, while Berg is institutional memory having only missed writing the second movie. Perhaps this writers’ reunion explains why the tasteless mining of Granny sloth’s Alzheimer’s for comedy has been quietly forgotten, but also why fantastic wordplay has largely disappeared; a situation not helped by ‘Son of a Birch Tree!’, featured in TV spots, being cut. But such are the necessary compromises, after all Jessie J voices a female sloth almost purely to allow her belt out a song in the finale. Ice Age 5 is a moderately amusing kid’s film which includes just enough for parents, including a blink and you miss it POTA gag.